Following hard on the announcement of the superb prizes on offer for the winners of the Millennium Movie Poster Project, we are pleased to be able to extend the deadline for entries by a week. In order to offer sufficient time for all interested artists to compose their entries, we will now be accepting poster submissions until September 4th. We have an esteemed panel of judges for the competition: Klea Scott, Mark Snow, and Lance Henriksen himself. 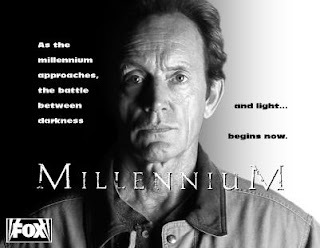 This really is a unique opportunity to have your art considered by some of the leading talents to have worked on Millennium. This competition offers you the chance to make your own visions of a Millennium movie into reality in the form of a poster design. The canvas is entirely your own in terms of format and content, so let your imagination run wild! There are 13 days remaining. 1 Response to "There Are An Extra 7 Days Remaining"